JOSEPHINE COUNTY, Ore. — A federal judge has sided with Mercy Flights in a civil lawsuit the Medford nonprofit filed against Josephine County and American Medical Response. A Josephine County ordinance passed in 2013 made AMR the sole provider of ground ambulance services in Josephine County. But in 2015 Mercy Flights and AMR reached an agreement, allowing patients at Asante Three Rivers Medical Center in Grants Pass who needed to be flown out of southern Oregon to be picked up by Mercy Flights ground ambulance. 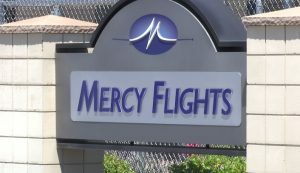 Mercy Flights said because of Josephine County’s 2013 law the county then threatened heavy fines, about $5,000 dollars per violation and prosecution. A Medford federal judge recommended the civil suit be ruled in favor of Mercy Flights and referred it to a district judge in Eugene. Nicole Costantino is a reporter and weather forecaster for NBC5 News. She comes to us from Phoenix, Arizona where she graduated from Arizona State University’s Walter Cronkite School of Journalism and Mass Communication. She also received a minor in Meteorology. Before coming to NBC5 News Nicole was an anchor, weathercaster and reporter at KAET in Phoenix, AZ. In college, she interned for CBS News in New York and theNBC4 Investigative Team in Los Angeles. In her free time, you can find Nicole cheering on the Sun Devils and exploring the Pacific Northwest. Feel free to send story ideas and chocolate chip cookie recipes to her on Facebook (@NicoleCostantino) or Twitter (@N_Costantino).